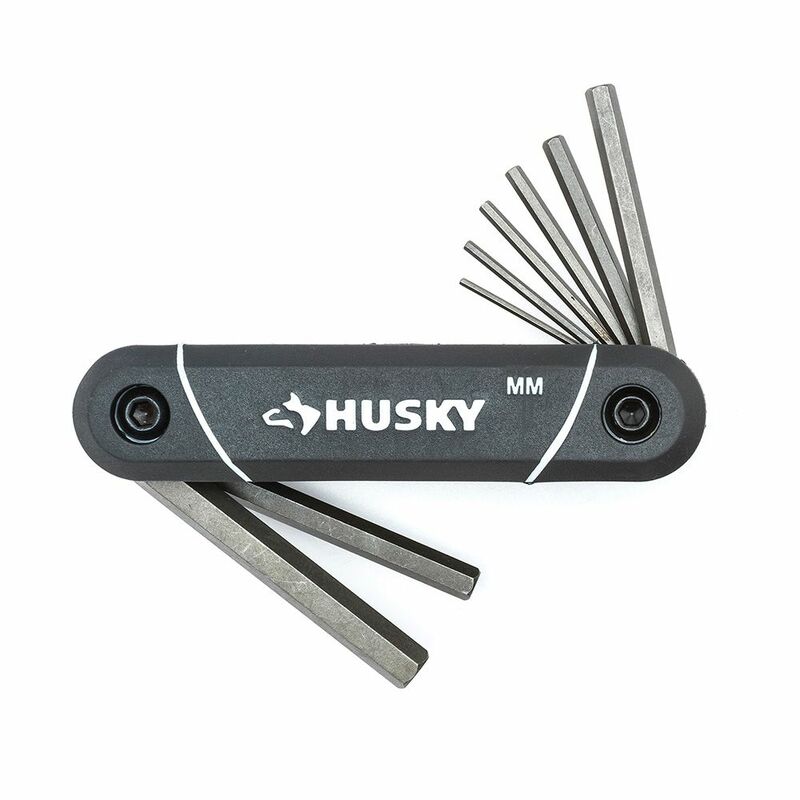 The Husky 8-Piece Metric Folding Hex Key Set is made of alloy steel for strength. It includes a range of metric hex keys that resist rotational distortion and fold up into the handle for efficient organization. The finish provides resistance to corrosion. The rolling head pry bars in this 3 piece set are specially heat-treated for maximum durability and forged from premium alloy steel. The royal blue paint finish provides exceptional corrosion resistance. Made in Canada and backed by Gray Tools worry-free lifetime warranty. The Husky #3 x 6-inch Square Screwdriver features a designed pentagonal type handle to provide greater handle torque and more comfort. Unique dual material handle remove grip slippage during high torque applications. The tip size marking is injected on the end of handle for easy identification and longevity. The alloy-steel blade is heat treated for strength, precision formed tip for accurate fit and limits cam-out. The Husky 4-Ton, 2 Jaw Puller features easily reversible jaws for both internal and external pulling applications. Manufactured from hardened alloy steel for added strength and durability, you can be sure that this Husky Puller can stand up to the most strenuous of tasks. Ideal for removing gears, pulleys and bearings that have been press fit onto a shaft or inside a hole. The Husky 3/8 in. Drive 8 in. Flex-Shaft Extension provides added length to your sockets for hard to reach fasteners. For those awkward angles the flexible shaft allows the extension to be bent into multiple positions. Its' alloy steel construction gives the tool added durability for a longer life. Metric Folding Hex Key Set (8-Piece) The Husky 8-Piece Metric Folding Hex Key Set is made of alloy steel for strength. It includes a range of metric hex keys that resist rotational distortion and fold up into the handle for efficient organization. The finish provides resistance to corrosion.